Some of us have been brought up on feet and inches, while the younger of us know only meters, centimeters and millimeters. However, if you live in Japan, you need to develop a “third sense” when it comes to measuring area. Japan has its own unique measuring system brought down from ancient times. This starts with the Tatami Mat. Anyone who has been in Japan for a period of time knows about tatami (woven straw mats), and probably know that it is how Japanese people communicate space (or lack of it) in a house or an apartment. A 6-mat room or “roku-jo no heya” in Japanese, is the standard sized room; 4.5 mats would be considered small or slightly cramped, where as an 8-mat or 10-mat room is generally considered to be quite a large room. Contrastingly, an 8-10 mat room would probably the standard size of a bedroom in a western-style home. The tatami mat and its “counter” – jo, are not used only for bedrooms however, but for each individual room including the living / dining / kitchen (known as LDK). 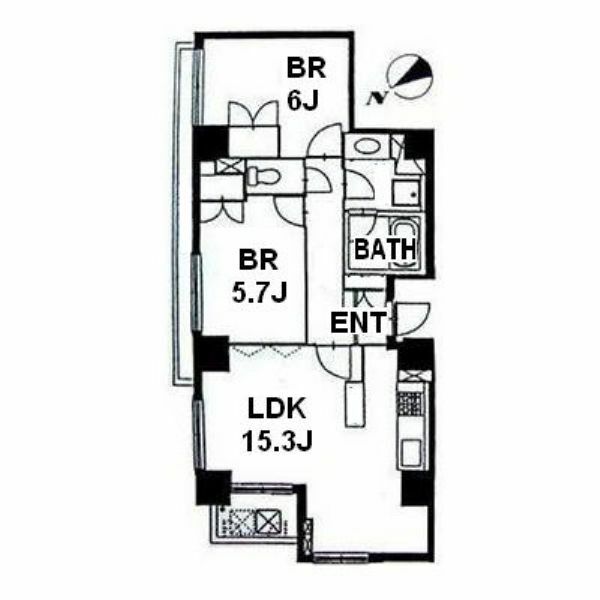 A 20-jo LDK would be considered very spacious in a Japanese apartment, where as the standard would probably be 10-15-jo. You can easily see the use of tatami mats as a counter of room area by taking a look at the floor plans displayed at local real estate agents such as “Mini-Mini”, Apaman-shop, Nissho, etc. Quite often they are referenced by a “J” for the counter “-jo”. For example, the LDK might read 13.0J and the bedrooms 5.5J and 6.0J respectively. So, how big is a one-jo (ichi-jo in correct Japanese!). Well, it depends where you live in Japan! The standard is close to 1.8 meters x 0.9 meters in a good part of Japan, but due to space constraints in cities such as Tokyo, often tatami are slightly smaller (and this is not an advertised fact- owners are very cunning in populate cities!). Standard Tatami sizes in Tokyo are 1.76 meters x 0.88 meters. While tatami are used as the “size indicator” of rooms in Japan, it is not so typical to express the overall size of a particular apartment or house in “so-many tatami”. ie. It is not common to add up the tatami count of all the rooms to express the total size. 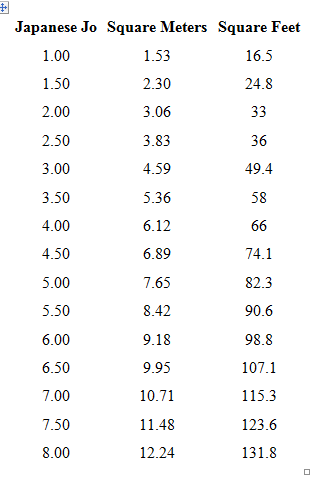 Total size is expressed in either square meters or “tsubo”. Where does Tsubo come from you ask? Well, historically 2-jo = 1 tsubo.